During his unfocused early adulthood, few would have predicted that George Walker Bush would ever find himself in a position to send White House Christmas cards. Born in New Haven, Connecticut on July 6, 1946 and raised mainly in Midland and Houston, Texas, the diplomat’s son went on to earn a B.A. in History from Yale University in 1968, and an MBA from Harvard Business School in 1975. In the intervening years, he spent time in the Texas Air National Guard, where he flew F-102 fighter planes. In 1977 he married Laura Welch, a librarian and schoolteacher, and the couple would have two children, fraternal twins Barbara and Jenna. After an unsuccessful congressional bid in 1978 and with the help of family connections, Bush entered the oil business. He helped found two small, independent oil exploration companies which were later taken over by large conglomerates after a decline in oil prices. Around the time of his 40th birthday, the wayward Bush gave up alcohol, turned to his Methodist faith, and described himself as a born-again Christian. He gained further political experience by working on his father’s successful 1988 presidential campaign and became managing general partner of baseball’s Texas Rangers in 1989. In 1994 he was elected governor of Texas, where he cut taxes and won a landslide re-election in 1998. 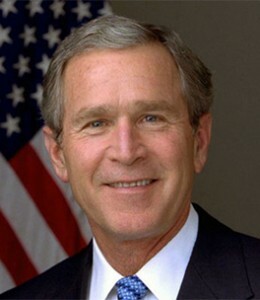 In 2000, he won the Republican presidential nomination over John McCain. In the infamous general election, Bush lost the popular vote to incumbent Vice President Al Gore by 544,000. The state of Florida would determine who would win the Electoral College and become president. In the original tally, Bush had won the state by just over 1,700 votes, triggering an automatic recount. He was declared the winner of the Electoral College on December 9 when the U.S. Supreme Court stopped the count of disputed ballots with his lead down to just 537 votes. For their first Christmas in the White House, First Lady Laura Bush enlisted the help of Hallmark Cards and classically-trained Texas artist Adrian Martinez to paint a White House-themed Presidential Christmas card. As a child who grew up only seven blocks from the White House, Martinez was intimately familiar with the exterior of the Executive Mansion. For the official card, he decided to paint an interior scene, which he felt would better exude a feeling of warmth. Impressed with an elegantly decorated corridor in the First Family’s private residence, he made a couple of sketches of the serene setting and sent them to the White House. After an eight-year hiatus, Hallmark returned to the Presidential Christmas cards arena for the 34th time. Produced at the company’s Lenexa, Kansas plant, the scripture which would appear on the insert was replaced with Psalm 27:3 at the behest of the First Lady after the September 11 terrorist attacks. The Psalm read, “Though a host should encamp against me, I shall not fear; though war shall rise against me, in this I will be confident.” Also included inside the White House Christmas cards above the holiday greeting were verses 8 and 13 from the same Psalm reading, “Thy face, Lord, do I seek” and “I believe that I shall see the goodness of the Lord in the land of the living!” The greeting itself read, “May happiness be yours during this season of goodwill and may the New Year bring peace on Earth. 2001.” Hallmark printed a record 870,000 presidential Christmas cards and 4,500 gift prints featuring the same design. For the 2002 White House Christmas cards, Mrs. Bush selected Chinese-born artist Zhen-Huan Lu to create the artwork. Lu’s style combined European realism, French impressionism and traditional Chinese painting. Mr. Lu snapped 200 photographs in the White House and surrounding gardens in search of an ideal subject. In the Grand Foyer, the artist came upon a beautiful antique Steinway piano. Moving the piano in front of a sunlit window, Lu knew he had found his subject. He felt the scene evoked a “very romantic feeling and would be beautiful to paint.” Said Lu of the 1938 concert grand and its Honduran mahogany case, “I liked the eagles that made up the piano legs because they symbolized the spirit and patriotism of the country, especially after 9/11.” Part of the room’s gilded pier table and the delicately carved English mirror above it were added to the scene along with a basket of holiday poinsettias. On September 20, a meeting which included Hallmark and the artist was held at the White House to make sure the intricate painting was reproduced with proper color hues. Proof sets of the composition were then shipped back and forth from Hallmark to Lu until he was satisfied with the final product. The Presidential Christmas cards design was entitled 1938 Steinway Piano in the Grand Foyer, The White House 2002. As would become custom, the Bushes included a scripture verse in their White House Christmas cards. For 2002, it was Psalm 100, verse 5: “For the Lord is good; His mercy is everlasting; and his truth endureth to all generations.” The Christmas cads were also imprinted with the following greeting: “May love and peace fill your heart and home during this holiday season and throughout the new year. 2002.” A record 1.15 million individuals received the official 2002 White House Christmas cards. The ever-expanding list included heads of state, American ambassadors abroad, members of Congress, cabinet members, members of the Republican National Committee, and state Republican parties, supporters, volunteers, and friends. On November 28, 1.5 million of the official White House Christmas cards were mailed to friends and dignitaries alike. The scripture verse included was from Job 10:12: “You have granted me life and loving kindness, and your care has preserved my spirit.” The greeting read, “May you celebrate the joys of faith, family and friendship this holiday season and always. 2003.” More than 8,000 gift prints were also produced by Hallmark. Ms. Holt was contacted in June and asked if she could make a few modifications to the painting. The main alteration was changing the painting from a horizontal to a vertical orientation. In addition, the room’s doors were left slightly ajar, a music stand with a carved lyre design was added, as was the room’s traditional cranberry tree (in keeping with the Christmas theme). Unlike Red Room-themed White House Christmas cards designed for previous administrations, the chamber’s French Savonnerie rug was focused on in detail. In highlighting a musical theme, the Scripture verse chosen was Psalm 95:2: “Let us come before Him with Thanksgiving and extol Him with music and song.” The greeting read, “May songs of joy fill your home with warmth and your heart with happiness this holiday season. 2004.” To celebrate President Bush’s narrow election victory, the First Family upped their count of official White House Christmas cards to just over 2 million along with 11,000 gift prints. dogs Barney and Miss Beazley and cat India. Featuring a snowy winter scene of the South Lawn, Wyeth chose an angled view of the Truman Balcony flanked by the magnolia tree which had been planted by Andrew Jackson in memory of his wife. Barney and Miss Beazley sat together on the snow-covered lawn, while India scampered off to the left. Hallmark again produced the White House Christmas cards, which included a verse from Psalm 28:7: “The Lord is my strength and my shield; In Him my heart trusts; So I am helped, and my heart exults, and with my song I give thanks to Him.” The greeting that appeared read, “With best wishes for a holiday season of hope and happiness 2005.” A run of 1.28 million Presidential Christmas cards was mailed to recipients in a total of 200 countries, along with 7,400 gift prints. My son Morgan is 6 years old and loves George W. Bush. For 2 years now Morgan has said he will be The president when he grows up. Morgan dresses up as many presidents. For school he was George Bush. Morgan collects president trading cards. Loves learning facts about presidents. We buy him kid president books and have to read them over and over. Morgan wants to meet George W. Bush and send him a christmas card. Merry Christmas..
That is too cute that he dresses up! I love President Bush, people are too critical of this nice man!